Can God speak to my heart while I’m cleaning the toilet? You ever have one of those days (weeks, MONTHS?) where you know just a little bit from God would go a long way? A little encouragement. A surprise around the corner. Something to tell you that you are ok and on the right track? Even just “Hey, I’m here with you! I’m not going anywhere”. Remembering times past where you felt God’s presence frequently and His words affirming your heart. I was reminded today of this. While cleaning the toilet (oh yeah!) and feeling incredibly spiritual (wink) it came; two really random thoughts popped into my mind. Both are areas that God has given revelation to me over the last two or three years. Then I “heard” him say that he was going to take those things deeper. It felt so good to hear SOMETHING. I wanted to sing or dance or laugh. “I still hear God! He speaks, he speaks!” Believe me, when you’ve felt thirsty you don’t underestimate a cup of water!!! It really really matters even if it’s seemingly so small. 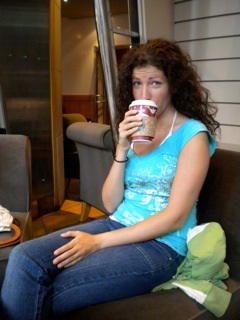 Then I headed to Starbucks to do what little Starbuckies do and enjoy a few minutes of quality time with my friend. Out of the blue she (without knowing my previous conversation with God) starts talking about those two unrelated things that God had been speaking to me earlier. Needless to say, we were both encouraged. She confirmed what I had been hearing and she also got to be reminded that she hears God’s voice too. Easy. I’d go to Finland and stay with my dear friend there and then we’d together romp all over Europe. We could easily cover most of the continent, having so many friends that we know scattered around. England, Switzerland, Belgium, The Netherlands, Norway, Ireland, and I’m sure there’s so many more I’m just not thinking of. After I got my fill of travelling, I’d return and find a job I LOVED—most likely with internationals. (I was just getting warmed up, by the way…there was a lot more I could have said). Then I asked her what she’d do. This led to talking about desires and dreams and how it’s really hard to dream when one is low in their hope tank. And how can we have hope or dream if we are disconnected to our own heart? So, YEAH, we gotta start taking those moments to listen to those desires that may be buried under some clutter. Because that’s where dreams are birthed. And who knows where God wants to take us? But, we’ll never know if we aren’t dreaming. And it all started with a toilet brush in hand! God must want u 2 keep cleaning toilets! Ha ha! Maybe that's where the best revelations come! I get revelation while I am on the toilet. You get revelation while you are IN the toilet. Interesting. There is a connection with coffee and dreaming with you Liz! Yep, Maggs….I think coffee opens the mouth of my heart and clears the passage ways for new things! Sounds like a good God dream Liz….why do you think he would put this into your heart….keep dreaming! I have had the same thoughts many times because I so want to see these friends again…and you know many of them are the same people. We also miss them! Too bad the FL International Forums are over!!!! The good old days! Thanks Jeanne! I know, I really miss that yearly connection, it was such life! But…the connection goes deeper than just a once a year…I know we will all continue to forge paths that intersect with each other's. Example, when I come to visit! ha ha…Or next time you are in this area!! love you!!!! and i think you would love my spanish professor.. she's been to 27 spanish speaking countries and regularly revisits them.. has a columbian husband and two little ones… and is a really vivacious young woman 🙂 she heads the foreign exchange dept at school also. I love your professor already! She sounds like someone that can't help but inspire and provoke people to dreaming every time she opens her mouth! And something I just was reminded of today. Jesus takes us at our own pace. He is so gentle and kind to our hearts. As we realize this, I believe we little-by-little trust him more. And then let him go to those buried dreams. Thanks for that raw honesty and being afraid. I think all of us are afraid of what we will find and what if we open Pandora's box? Just to be open with you, just tonight I got together with a friend who prayed through some issues with me. And I found Jesus to be so patient and kind with my heart that I feel some more trust was built. Cheering you on, Sara Jane!!! !